Once upon a time there was a genie, of the type who comes out of magic lamps and makes wishes come true. 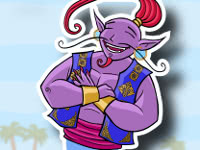 Unfortunately, this particular genie was famous for botching things up. Whenever someone rubbed the magic lamp, he would come out and say, "What is your wish?" Then a great cloud of smoke would appear and hundreds of things would fly through the air. When people stated their wish the object of their desire would appear in a cloud of dirt, covered in dust. So many, and so embarrassing were his botches that no one wanted him. His lamp ended up being used only to throw at people, just like a common old box; and the genie didn't come out of it for years, and became sad and depressed. That was, until a lonely boy found the lamp, and could hear the sad cries of the genie inside. So the boy decided to try to become the genie's friend, and the wish he asked to be granted was to be able to enter and leave the lamp, just like the genie could, so they could spend time together. The genie was happy to grant this wish, and as soon as the boy entered the lamp, he could see what the genie's problem was. It wasn't that he was a bad genie. It was just that he couldn't have been less tidy! In the lamp everything was thrown all over the place, whether it be jewellery, books, boats or camels. It was obvious that the place hadn't seen a duster for years. Being a genie, he had all sorts of stuff in there, and as the lamp was small, everything was crammed in together that whenever the genie tried to get something, a cloud of dust would fly up. The boy held his head in his hands, and the genie apologised, saying that a genie's job was very important and he hadn't had time for cleaning. But the boy remembered his mother's advice, and told the genie that the more important his job was, the more important it was that he keep all his things in order. And together they decided to give the place a good clean.